Forrest Edward Frierson, son of Robert D. Frierson and Jessie Ruby McMillan, married to Virginia Dell Swindle and buried in Restland Memorial Park Cemetery, Dallas, Dallas Co., Texas. FRIERSON, Forrest E., of Garland, Tx , age 67, died August 14,1991 in Dallas. Forrest Frierson was born in Lawn, Texas on July 17, 1924. 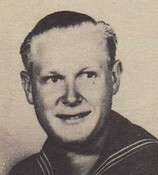 He attended Lawn Schools and served in the U.S. Navy during World War II and served on The Battleship Pennsylvania. He worked for the City of Garland, Tx for many years. Survived by his wife, Virginia Frierson; sons, Dave & Randall Frierson; daughter, Jerenda Cox; grandchildren, Sheri, Eddie, Eric, Zack & Tiffany; sister, Bobbie Mattingly. He was preceded in death by his parents, Robert and Ruby Frierson. Services, 3:00 P.M. Friday, August 16, 1991, First Baptist Church of Garland Chapel. Dr. Roger McDonald & Rev. David Francis officiating. Interment, Restland Memorial Park in Dallas. Family to receive friends 6-8 P.M. Thursday at Restland Funeral Home.